How Can I Use Crystals To Help My Dog's Seizures? HI, My 2 year old cockapoo pup has recently began having seizures. Someone encouraged me to look into Healing Crystals. I saw various crystals that could be helpful, such as Jet. However, am unsure how to use them. I would like to place it on her collar but unsure how to do that. I did not see any with clasps, etc. If you have any suggestions, I would greatly appreciate it! Thank you so much for question about which crystals will help your dog with seizures. It is awful when our pets aren't feeling well so I really hope that she feels better very soon. Jet is very helpful for healing seizures. 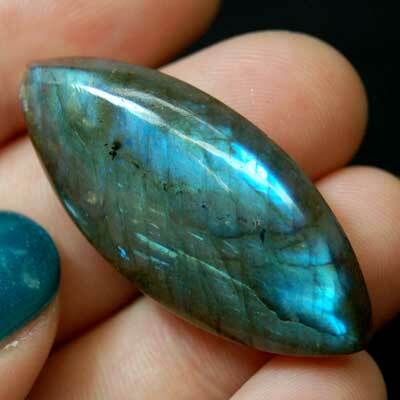 I also think that Seleniteand Labradorite(I especially like the Labradoritefor your dog) will provide healing vibrations. Blue Lace Agate has a very calming and loving influence that I think she would respond well to and will help her remain calm and let the healing work. Probably the best way to get the crystals on her collar is using glue. The glue will not alter the crystal's healing energy and I would suggest that you use a non toxic form of glue (something similar to what children use in school) since you don't want your dog to accidently ingest anything harmful. Also if she is around other dogs that may not be as well trained as she is you want to make sure they are not harmed. While you are gluing the crystals I would charge them with your intent - for instance that they help your dog with her specific illness. That way you can "glue" your positive intentions while you attach the crystals. Another suggestion is to charge her water with the crystals. I would not place the crystals in her water but place them around the water before you give it to her. Here is a video about charging water with crystals and we specifically talk about placing the crystals outside of the water. I hope that you will let us know if we can be of any further service and I am wishing you and your dog lots of love and light!